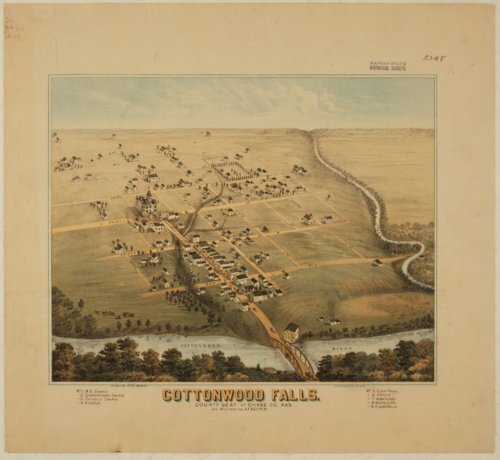 This colored lithograph is a bird's eye view of Cottonwood Falls, Kansas, which was the county seat of Chase County. The legend at the bottom identifies churches, schools, the Courthouse, hotels, newspapers, wagon shops, and a flour mill. Street names are given. The Cottonwood River and Spring Creek run near the community. A subtitle indicates that Cottonwood Falls is one mile from the Atchison, Topeka, and Santa Fe Railroad. The lithograph was drawn by D. D. Morse and published by Lott & Zeuch Lithograph, Chicago, Illinois.